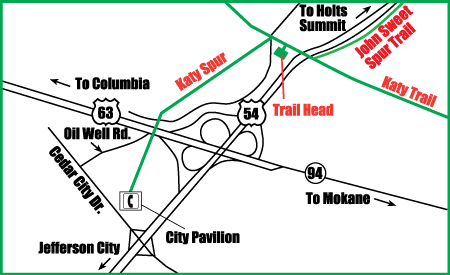 The Jefferson City Parks and Recreation Department built and maintains a Katy Spur trail that connects with the Katy Trail at the North Jefferson trailhead. The Katy Spur runs south one mile and ends at a pavilion near the intersection Hwy. 63/54 and Rt. W in the former town of Cedar City. The Jefferson City Parks and Recreation Department also built and maintains the John Sweet Trail Spur that connects with the North Jefferson Trailhead just east of the Hwy. 54 overpass. This spur runs approximately 3/4 mile to the north and connects user to Holts Summit via a road route.